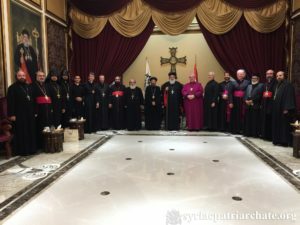 On October 24, 2018, His Holiness Patriarch Mor Ignatius Aphrem II met with the members of the Anglican–Oriental Orthodox International Commission (AOOIC), which holds its sixth meeting at our Syriac Orthodox Church in the Patriarchal Residence – Atchaneh, Lebanon. His Holiness welcomed the members and wished them a successful meeting. He highlighted the major stages of not very old dialogue between the Oriental Orthodox Churches and the Anglican Church, as well as the significant fruits of the dialogue. He also spoke about the importance of dialogue in bringing Churches together until we reach complete unity as one body whose Head is our Lord Jesus Christ. In turn, the members of the commission thanked His Holiness and our Syriac Orthodox Church for hosting the seventh meeting, and gave an overview about their work. Their Eminences: Mor Theophilus Georges Saliba, Archbishop of Mount Lebanon and Tripoli, Mor Severus Malke Mourad, Mor Justinos Boulos Safar, Patriarchal Vicar in Zahle and Bekaa, Mor Chrysostomos Mikhael Chamoun, Patriarchal Vicar in the Patriarchal Benevolent Institutions in Atchaneh, and His Eminence Mor Timotheos Matta Al-Khoury, Patriarchal Vicar in the Patriarchal Archdiocese of Damascus, attended the meeting. His Eminence Mor Polycarpus Augin Aydin, Patriarchal Vicar in Holland, and Very Rev. Raban Roger-Youssef Akhrass, Director of the Department of Syriac Studies, who are the representatives of our Syriac Orthodox Church in the commission, also attended the meeting.